Like the parents of most small children, we took Anna to meet Santa Claus this year ... and like most small children, Anna hated him. I figured this would be the case, so I decided early on that we'd skip the mall and search out a more casual setting. A local "breakfast with Santa" seemed to fit the bill and at $5 a person for all-you-eat pancakes, including a free picture with the jolly man himself, we were sold ... especially knowing we'd spend that much on just a picture at the mall. It was pretty packed when we arrived and Anna determined right then that she wasn't a fan of this outing by literally crawling up Mike's body to her version of safety. We got our breakfast first and she LOVED the pancake, eating one at least twice the size of her head. We stopped over to meet Santa afterwards and she was a trooper, but still had no desire to have any part of sitting on his lap, or anywhere close to him for that matter. Thanks to Mike for taking one for the team and posing, no chance I was going to manage that situation 6+ months pregnant and already feeling swollen and fat. A random turn of events had Anna calling any Santa figurine (or snowman) "Ho Ho" as of last weekend; and of course in the sweetest voice imaginable. I'm not sure where she learned that, but she had a ball at my Mom's house point to and waving at the many "Ho Hos" ... so, maybe he's growing on her? Doubtful, but I guess we'll see next year. You are literally growing by leaps and bounds as we move into 2013. 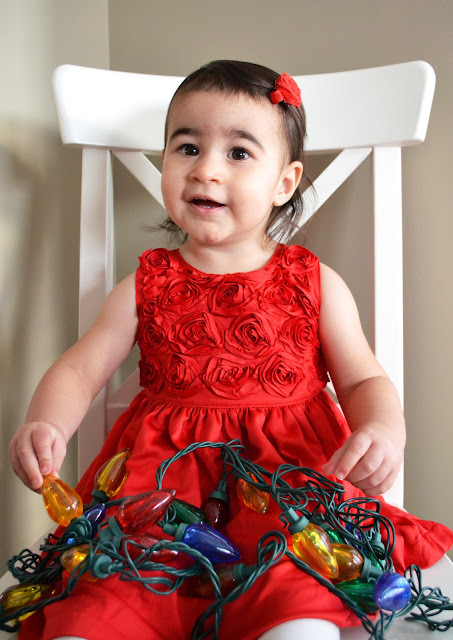 At your 18-month check-up you checked in at 23 pounds (25th percentile) and 33 inches (80th percentile), our long and lean girl. After reviewing your growth chart, your paediatrician even looked at me and asked what height your Dad and I are and made a note in your file since you seem to be shooting up dramatically. Regardless of what your percentiles say, we know you’re healthy because you’re one of the happiest girls around, not to mention that we’d love you at any size. What this does mean is that you are very quickly growing out of the wardrobe I thought would last through the winter and until spring. Your pant legs are rising up and your shirts are flirting with your belly button, so we’ll be moving into 2T gear pretty soon. You’re learning and growing so much each day, it’s simply amazing to watch. You are more interactive by the day and your vocabulary is growing by leaps and bounds. You understand pretty much all of what we say, can communicate mostly what you want (clearly to us, maybe not as much to others), and are great at now recognizing when you want something or not with a clear “yes” and “no.” Of course you will also use “yes” or “no” to persuade us to do what you want in any given situation. My favorite instance was over Thanksgiving when your Uncle Sean took you and your larger-than-life puppy that lives at Grandma’s house on an impromptu ride in the family room. Little did he know you’d love it as much as you did and would insist the rides continue until his back was probably about to give out. The next day you mounted your puppy and looked at Uncle Sean with a huge smile and said “yeeeesss, yesssss, yesssss” before he could counter with “no, not right now” as had happened the day before. You started in a new room at school this past month and we saw some stranger anxiety for a few weeks, but overall you adjusted well. All of your close buddies have now moved up as well and that seemed to help. A little diversion with a snack / leftover breakfast with your friends did the trick eventually and now you hardly bat an eye when Dad leaves. You are taking one nap a day and do great at school sleeping from 12:45pm – 3:00pm on your cot and will sleep for just about that long at home. You’re learning a lot with your new teachers; I as blown away when I picked you up last week and pulled out your daily paper that showed a large-print letter A and you ran over and said “A, A, A, ...” over and over, and then a few days later it was the letter of the day on Sesame Street and you identified it before they said a thing. You love to sing along to the ABC song and we’re working our way through the entire song, it’s only a matter of time before you can sing it on your own. You love to sing and dance and it’s are just a happy girl in general. You’re fairly vocal about which songs you want to sing and are loving the Christmas music on the radio ... but also not afraid to tell us when we need to stop singing along. You love to twirl around the family room when a favorite song comes on, or just when the mood strikes and love to also dance with us. On the flip side, as much as you love to be interactive, you also love to sit with a good book and read. Your paediatrician was very impressed when he heard that you will sit and “read” by yourself for almost as long as you’ll cycle books to us to be read to you. I love it when you come over with a book and instinctively turn around to sit in my lap or have me pull you onto my lap; although space is getting short, we’ll continue to find a way to make it work. You’re a fairly good eater for a toddler, but aren’t going to win any contests for variety. You love fruit, pretty much any fruit, but especially raisins and bananas as of late. You love cheese and pasta and are still mostly rejecting most meat, so we get our protein elsewhere. You’re hit or miss on veggies, but do love frozen peas and those often serve as your dinnertime appetizer while I’m finishing up preparation ... I’ll take your veggies where I can get them these days. I’ve started giving you a gummy vitamin each day and you love it, always asking for “more,” so at least you’re getting some stream of regular vitamins. We still give you whole milk at home, but you get a small amount of fruit juice at school with your afternoon snack each day. You love your milk and immediately want your cup and a snack when we get home from school each day, I joke routinely that your hollow leg must have a leak because it never fills up. The special bond you have with your Dad continues and I love to see it growing each day. I know that when your sister arrives you and Dad will spend a lot of time together and it warms my heart to think that you’re already so close. Almost nightly you guys are running around the house in a game of chase, Dad’s taken over primary bathtime duty, and you guys have special games you play on the way to school. You love to help both of us out with any given task and have taken to throwing your own diapers away and putting your wipes back in the basket after a change. You had a blast helping your Dad with the leaves a few weeks ago and loved helping with the Christmas tree and decorations. 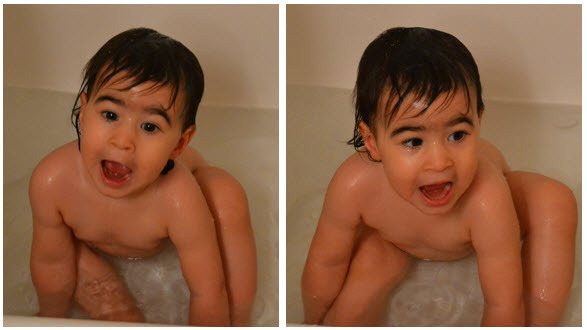 This past month we taught you “ring-around-the-rosie” one evening right before bed. You were so excited as we went through the motions together that that you could hardly move your feet fast enough to keep up. In fact, I’m pretty sure we should have timed it so that learning this “dance” was your Christmas present. It’s a combo of your favorite things: dancing, singing, and Mom and/or Dad; anytime the three of us are together you’ll grab our hands to form a circle and off we go. The 15 minutes we spent doing ring-around-the-rosie that first evening will go down as one of my top moments in life. Ever. I can’t tell you how amazing it’s been this past year and a half to see the world through the eyes of a child. You make every day brighter and even when you’re testing our patience; you’re still the sweetest and most loving child around. You’ve taught me what unconditional love really means and I’m learning as much as you are on a daily basis. Thank you for putting the big and little things in life into perspective, I never thought I’d learn so much from someone so little. I recently found a new food blog that I'm loving and love the idea of the Clara Project and trying out old recipes. One of the first recipes I read on the site was for the the old-fashioned sugar cookies and I immediately thought they'd be great for holiday exchanges, or any time of year with the right cookie cutter, but wanted to give them a try before making them for mass consumption. Luckily my good friend Amber was a willing participant in the trial run. The first batch turned out OK, but needed to be baked a minute or two less, and I wasn't in love with the idea of using shortening. Round two included butter and less bake time, and bingo, just what I was looking for, a simple, easy-to-decorate, classic cookie. Almost every recipe posted to this site spikes my interest and I'm excited to try out this recipe, this recipe, and this recipe next. In the bowl of a stand mixer (or in a bowl and using a hand mixer), cream together shortening and sugar until light and fluffy, about 2 minutes. Add the beaten egg and mix to combined; add milk and extracts and stir to combine thoroughly. Sift together the flour, baking powder and salt and add to the mixing bowl; stir to combine well. Transfer the cookie dough to a sheet of waxed paper or plastic wrap, cover and refrigerate for about 30 minutes. Preheat oven to 350 degrees; spray a cookie sheet lightly with cooking spray, or line with parchment paper. Divide dough in half and roll out one half to about 1/8-inch thick (keep the other refrigerated until ready to use). Cut out shapes with a cookie cutter dipped in flour; transfer cookies to the baking sheet about 1/2 inches apart. Brush the cookies lightly with egg white and sprinkle generously with granulated or decorative sugars. Bake for 12 to 14 minutes, until edges are very lightly brown. Remove baking sheet from the oven and let it sit for 1 minute before transferring cookies to a baking rack to cool. And after it's all said and done, you're worn out, but SO glad you have a friend that can make your child giggle with pure joy, understands your crazy life as a working Mother (even though she's not one), makes your cookie recipe a success when you were ready to throw it down the drain, can sit and catch-up over lunch and a Fresca like no time has passed, and whom you know will ALWAYS be a text or phone call away when you really need her. I'm lucky to have such wonderful friends in my life! We don't have a ton of trees in our yard, but enough to make raking once or twice in the fall a necessity, so last weekend Mike went out to load up a few yard bags. I needed to make our (big) weekly trip to the grocery store and said I'd take Anna with me so that he'd be uninterrupted. He looked at me a little sad, saying, "I thought she'd want to help me and play in the leaves." I'm sure I looked at him like he had four heads and said "yeah right, you'll get nothing done," and off we went to the store. We got home less than an hour later and Mike grabbed Anna from the car and kept her outside while I unloaded the groceries. 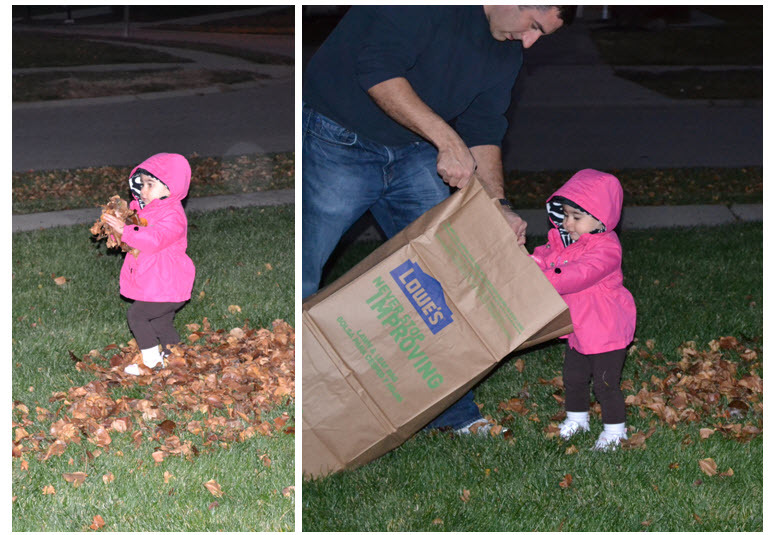 Not 10 minutes later I went outside to see how much (or little) help she was offering and was shocked to see she *was actually* helping load the bags with leaves! It's just like me to underestimate our little girl, and just like Mike to suggest an idea so crazy (to me) that it actually works. In no time at all, Anna was bringing hand fuls of leaves over to the bags and even saying "thank you" as Mike said it to her : ) Although I'm sure her enthusiam for raking leaves will wain over the years, but we'll enjoy our big helper while we have her!